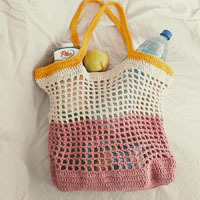 Go to original pattern for design DROPS Extra 0-860. 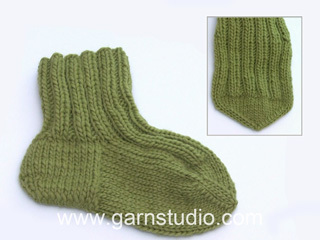 Knitted DROPS Christmas socks in ”Fabel” size 35-43. See diagrams A-1 to A-4. 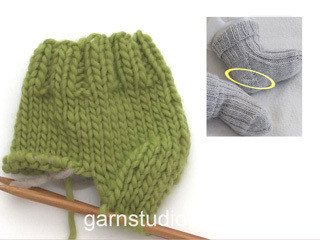 Work entire pattern in stocking st.
HEEL DECREASE: Worked in pattern A-4. Continue dec like this with 1 st less before every dec until there are 15-15-15 sts on needle. Worked in the round on double pointed needles. Cast on 66-72-72 sts on double pointed needles size 2.5 mm with red. K 1 round, then work rib = K 1/P 1 until piece measures 6 cm. 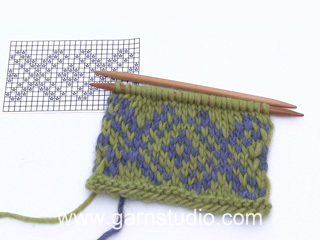 Switch to double pointed needles size 3 mm and work A-1 (= 12 sts) over all sts. When A-1 has been worked 1 time vertically, work 1 round with red while AT THE SAME TIME adjusting no of sts in the smallest size to: 64 sts. Then work as follows: A-2A (= 3 sts), A-2B (= 23-31-31 sts), A-2C (= 3 sts), A-3 (= 35 sts). NOTE! On round 8 and 16, dec 1 st on each side of diagram A-3 as shown in diagram = 60-68-68 sts. When diagram A-3 has been worked 1 time vertically, slip 29-37-37 sts (= diagrams A-2A, B and C) on a stitch holder = 31 sts for heel. Work A-4 back and forth over heel sts for 5-5½-6 cm, insert a marker, then dec for heel – see HEEL DECREASE. After heel dec, knit up 12-13-14 sts after A-4 along each side of heel and slip the 29-37-37 sts from stitch holder back on needle = 68-78-80 sts. Continue the 29-37-37 sts on top of foot in diagram A-2 as before, work sts under foot in diagram A-4 = 39-41-43 sts. AT THE SAME TIME dec on each side of diagram A-2 (sts on top of foot). K the 2 sts before diagram A-2A tog and K the 2 sts after diagram A-2C twisted tog (i.e. work in back loop of st instead of front), repeat dec every other round a total of 6 times = 56-66-68 sts. Continue diagrams A-2 and A-4 until piece measures 18-19-22 cm from marker on heel (= approx. 4-5-5 cm remain). Then work as follows: A-2A, A-4 over the next 23-31-31 sts over foot, A-2C,A-4 over the next 27-29-31 sts under foot. AT THE SAME TIME dec for toes on each side of diagram A-2A/C. Dec 4 sts per round. Dec as follows before diagram A-2A/C: K the last 2 sts tog. Dec as follows after diagram A-2A/C: Slip 1 st as if to K, K 1, psso. Dec every round a total of 10-10-10 times = 16-26-28 sts remain. On next round, K all sts tog 2 by 2 with red = 8-13-14 sts. I don’t understand this pattern. Absolutely love your collection of free patterns and these socks are awesome! I can't wait to see my niece wearing them! 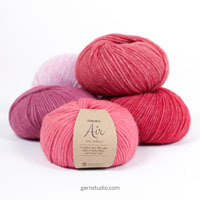 The yarn is beautiful and easy to work with! thanks again! Jeg har nok Fabelgarn til å strikke disse fine sokker. Men genseren i norsk mønster som jeg har strikket i Fabel med rød og hvit er dessverre blitt rosa og hvit etter vask(vaskemaskinens ullprogram med Milo) Hvordan kan jeg unngå det neste gang? Har aldri opplevd det med annen garn før . Hej Martina. Det var synd. Det kan desvaerre ske at garn indeholder overskudsfarve. Hvis jeg har nögler i staerke farver, vasker jeg enten garnet först for at faa det meste overskudsfarve ud - eller jeg vasker med en smule eddike tilsat, det plejer ogsaa at vaere godt. In the photo the top of the toe is done in stripes (diag A4). 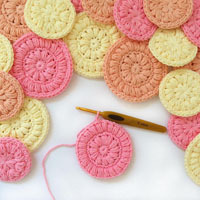 The instructions do not advise switching to that diagram but to continue with the main pattern, decreasing either side. Also in the second last line of the pattern, it says 'with red K" around.' I believe that should be 'with red K2 together around." Dear Edogirl, you work A.2 and A.4 until piece measures 18-19-22 from marker on heel - then work A.2A A.4 over the next 23-31 sts (= stripes on upper foot), A.2C and A.4 over the next 27-31 sts (under foot), at the same time, you will dec before and after A.2A and A.2C to shape the toe - dec will be done in red. Happy knitting! Man stickar sockor uppifrån och neråt, men man läser diagram nerifrån och uppåt. 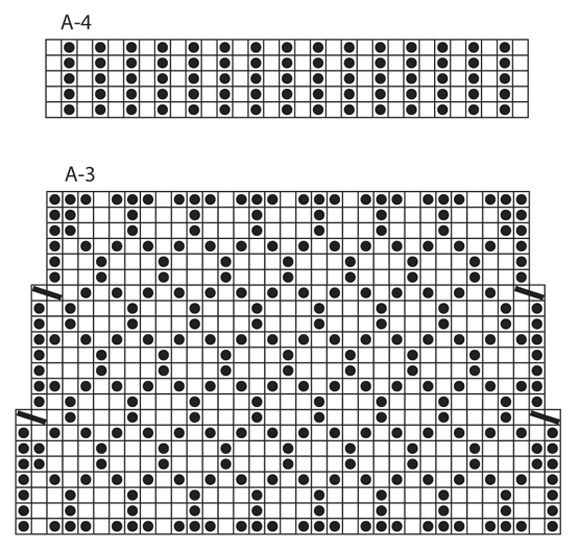 I might be wrong, but I think the pattern for A-1 (in Swedish, if it matters) is not the same as the picture shows. Look at where the white line is. 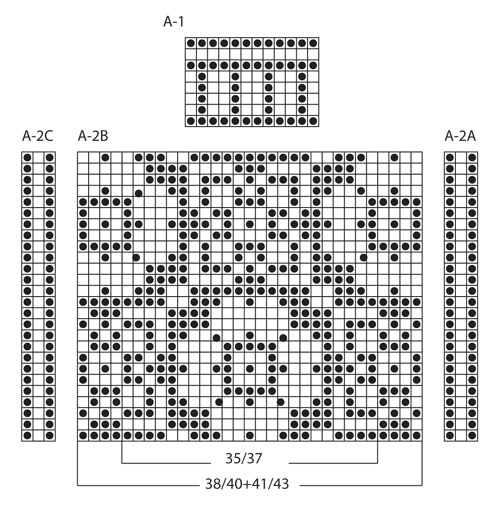 The pattern states that it is second row from top. The picture shows it at the bottom instead. I'm just at the beginning of it all now, but as it seemed wrong I thought I should say something about it. Dear Stina, please read diagram as follows: Begin in the lower righ-hand corner and work towards the left, ie for A.1 you will start with 1 round in red, and next to last round is 1 round in off white. Happy knitting! All of your sock patterns for women stop at size 9 1/2 / 10 1/2, which is my size in the US (I wear 41-42 in European sizes). My niece has 14-inch feet. I can not imagine what European size that would be. 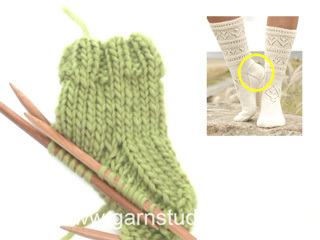 Can you advise me how to adjust the sock directions to be able to knit a pair for her? Thank you for your time. Dear Mrs Taylor, you could maybe find a similar pattern to the correct size (check with socks for men where you'll find larger sizes) to help you to adapt these one for your daughter. Happy knitting!